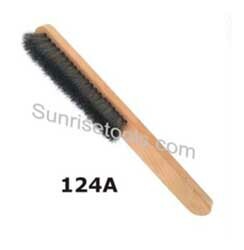 Description :- This Nylon Brush is ideal for cleaning work bench, dusting and general purpose work. 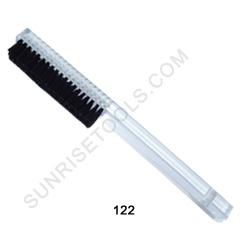 Brush Nylon set in wooden handle 4 rows. Handy and durable. 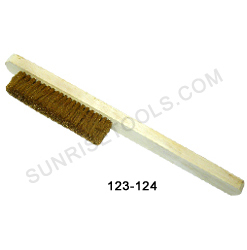 Description :- This cleaning brush can be used for a variety of purposes and also this is perfect for cleaning a jeweler's or watchmaker's workbench where it's hard to reach. It is made from superior nylon and wooden with 6 rows. 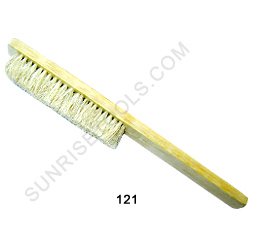 Description :- This natural bristle brush is made for watchmakers and jewelers to help them and keep their watch and jewelry tools clean. This is a must have workbench tool. 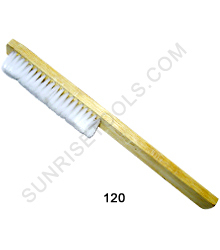 It has four rows of bristle with Wooden handle. Description :- Ideal For Cleaning out polishing composition and second hand Jewelry/Watches , Particularly, behind a stone set pic if one does not have an ultrasonic at hand. Simply run water from your tap over your item and because of the unique stiff bristles, it will clean into the most intricate spaces. Description :- Brass is a softer wire than stainless, and brass brushes are ideal for application where you do not want to scratch other surfaces. 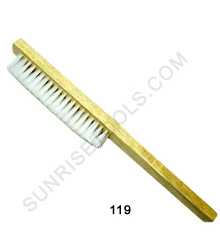 Our Brass Brushes are made with finest alloy used, and are resistant to rust an corrosion.